Your Facebook Friends Are Watching You—Did We Just Move Closer to 1984? George Orwell’s novel 1984 begins with Winston Smith, the main character, seeing posters saying BIG BROTHER IS WATCHING YOU. In 2010, that could be replaced with FACEBOOK IS WATCHING YOU. Or rather, YOUR FRIENDS ON FACEBOOK ARE WATCHING YOU. You and your friends can now post where you are and share this information, if you so chose. 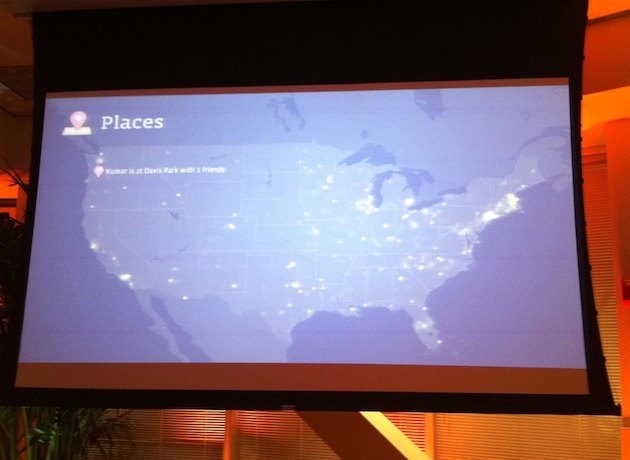 Facebook showed off the power of this new location feature at a launch event this week with a giant projection of a U.S. map showing where people were checking in just moments after Places launched. MG Siegler called it “Facebook’s Awesome Dark Knight-Esque Live Check-In Display.” But it was one of the scariest things I’ve seen. Facebook only showed people’s first names, but their databases know your last names and so much more about you. To me, it looked exactly what the inside of Orwell’s Ministry of Love would have looked like. That government group was responsible for identifying and monitoring dissidents. Of course, there are many important differences. Facebook is not the government. Your location information is voluntarily given by you or your friends, not obtained from a vast network of telescreens (more on that later in the post.) And, the information is kept private… well maybe. Your friends can check you in without you knowing it until after the fact. In a post yesterday, MG said “Places is actually pretty great — potentially”, but he acknowledged “the friend tagging thing is troubling to a lot of people (particularly because of the somewhat confusing three states. )” Agreed. He also wondered how long it would be until the big Facebook location backlash. Sorry, MG, I think it’s started. I expect we will learn over time how many users allow friends to tag you, turn Places off, or stick to the default limbo land, where most users are now. Sure, some users are bound to be confused and their intentions won’t match their settings, resulting in some unhappy users. How long will it take for all of Facebook’s more than 500 million users to figure it out? But, I want to focus on users who opt-in to allow tagging. Whether they are using location services to provide the “missing link between social networks and the real world” or because of peer pressure, do they realize or care they have just given up one last piece of their privacy? And that loss was initiated by themselves or their friends, people they trust. Everything we do, everything we buy, everywhere we go is tracked and sitting in a database somewhere. Our location via our phone, or our car GPS. Our credit card transactions. Everything. Fair point. Sounds very 1984 already. But, in the actions he cited, the loss of privacy is mostly a side effect. It’s our choice to buy something, but the capturing of the credit card data is a side effect we have to endure. Using Places, the point is to lose some of your privacy — the quality or condition of being secluded from the presence or view of others — by voluntarily handing over your location information. We all assumed the telescreen was the television. There was a telescreen in Winston Smith’s living room. But, there were also many telescreens out in public. I think the iPhone or a smartphone could be considered a telescreen too. That sounds like a smartphone plus Google Maps with Street View. We do turn off our TV’s, but for many, it’s much harder to turn our phones off. Now we are both transmitting and receiving information with these mobile devices. And with Places on, we can be watched (tagged) at any given moment. We are certainly not in a place where they watch everybody all the time, but rather we are all watching each other. I know many users will love Places and what it can do. They won’t care about the loss of privacy. Some of us, including me, still value the tiny amount of privacy we still have. We don’t want to be a dot appearing on Facebook’s live map. So, we’ll choose to opt-out for now.